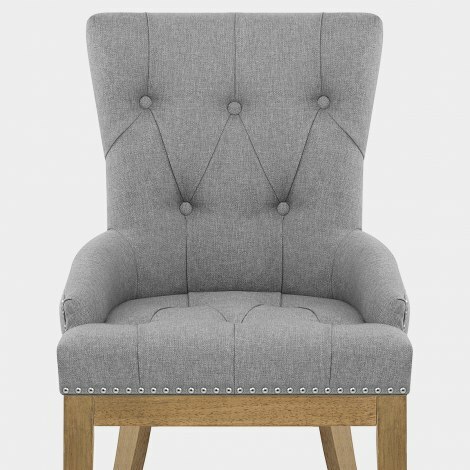 Class and elegance are key characteristics of the Knightsbridge Oak Dining Chair Grey Fabric, a traditional design with ornate details. 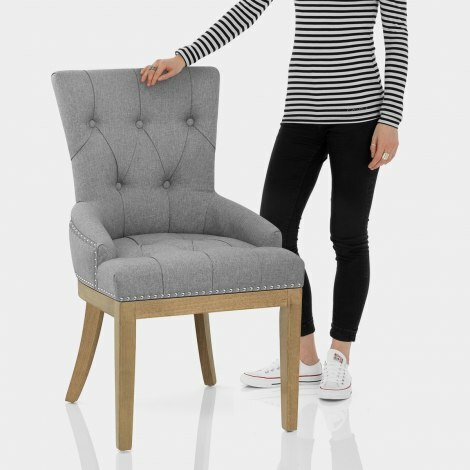 Designed with style, the seat has a belted support for ultimate comfort and is completely upholstered in stylish grey fabric. Meanwhile, the button detail and metal stud edging offer an exclusive opulent touch. The four legs provide a strong support for the seat, with each one crafted from solid wood. The wood frames the underside of the seat for classic appeal and a natural oak finish lends a rustic aesthetic. Finally, protective plugs sit below the legs to ensure the Knightsbridge can be safely used on many floor surfaces.